So this has been way, way overdue! 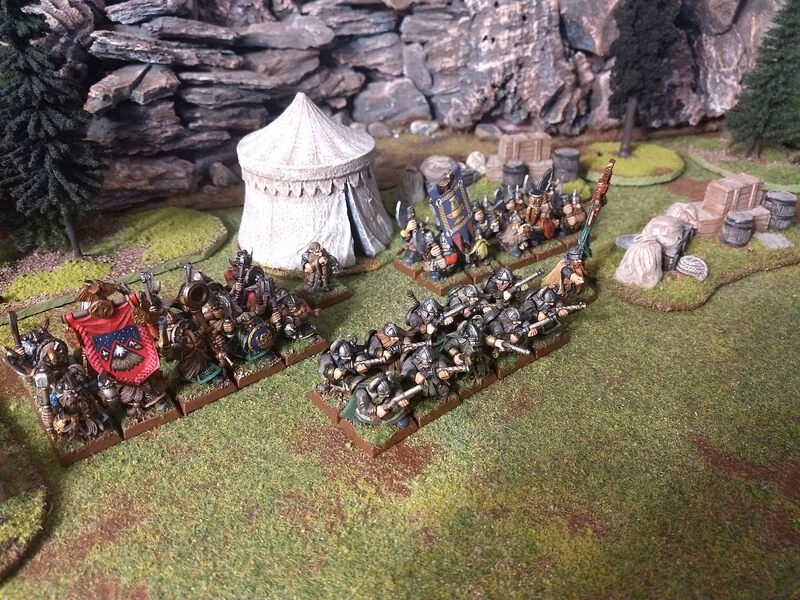 Back in July Steve (Mr. Owl) and I played another game with my dwarves, this time vs. his Empire army. 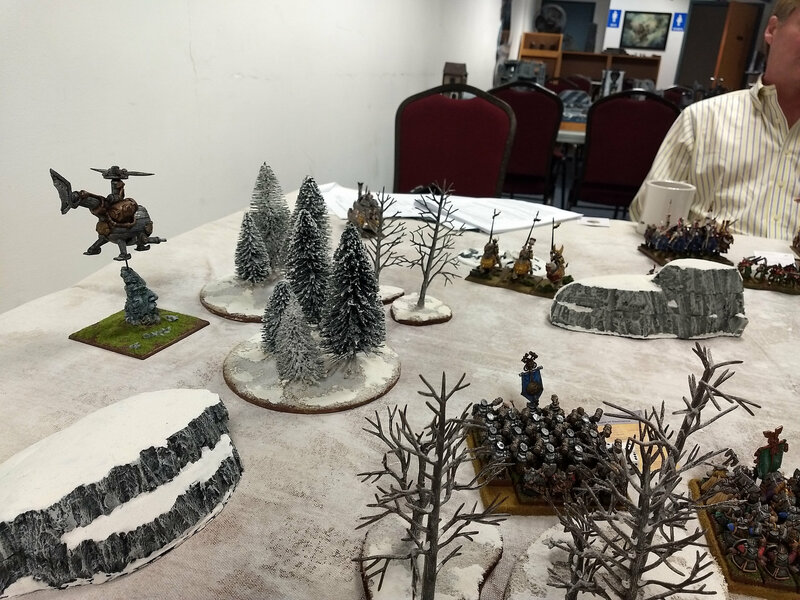 We played on my snow terrain table which added a lot of fun and immersive visuals to the game. The snowy setting also gave us some great ideas as to exactly why the dwarves and the Empire would be in this god forsaken, frozen place so far from their homelands and safety. We tossed around some potential ideas, but then Steve came up with one that I knew we HAD to use. Sheer brilliance. He thought, "Hey, what if there's some old mine up here that contains a vital ingredient for making black powder for guns." Long abandoned by the dwarves because it was far north and so difficult to reach given the harsh conditions and climate. So the Empire studies some old survey maps and see the old dwarf site. Thinking that the dwarves had long forgotten about the mineral deposits and with the Empire always needing fresh supplies to keep its musketeers and war engines supplied with plenty of gun powder, the Empire sends out an expedition to scout out the site and if possible begin mining operations there. BUT - wouldn't you know it! SOMEHOW those crafty dwarves who hadn't come near this place in close to eighty years, catch wind of the Empire's attempt to claim this mineral deposit that was originally discovered, surveyed and dug by the dwarves. AND, the dwarf king has a very detailed and thoroughly long-winded and dwarfy document which they say proves the mine belongs to them and NO ONE else. So the king gathers his own forces and heads north into the snowy wastelands. Among his baggage is this document along with a trunk of other paperwork that should settle the matter legally as far as who owns this mine. But as the armies both close on the remote site, the Empire general has no intention of backing down after learning of the sheer size of the mineral deposit. Any chance of a diplomatic settlement or agreement to perhaps split the deposit between the two factions quickly dissolves. The Empire's reasoning is simple if arrogant. You left this deposit here nearly 100 years ago and NOW you suddenly take an interest in it again? Sorry, finders keepers, there's no legal claim over it. But the dwarf king has his own reasoning. A stack of legal papers of ownership which he says shows the dwarf kingdoms have clear ownership and rights to it. And the dwarf king adds...there is NO expiration date in these papers, the dwarves have a right to leave it there as long as they wish. And come and get it whenever they wish! I'll be writing the full story of the battle as I did with previous battle reports, from a completely narrative perspective. But I will tell the story as closely as possible as it happened turn by turn during the actual game. However, before I commence delving into the actual battle, here's a little prologue I thought of to start the campaign off. Some grim humor provided by two dwarf scouting pilots flying a steam copter through a frozen pass looking for any signs of the approaching Empire army. The dwarf steam copters are the most part hardy, sturdy flying machines. But their steam engines are not ideally designed for a climate this cold, and the copter struggles to stay aloft as the two dwarves wipe the snow from their goggles and pray that their copter doesn't take them crashing down into the frozen valley far below! The steam copter shuddered. Its engine chugged erratically and suddenly sputtered and for a moment seemed to stop. At the last moment it recovered, kicking back into full power but making the entire craft shake violently. "Ohh, no no DAMMIT! SEE?" The dwarf pilot cursed as he pulled back hard on the throttle lever. The lever was vibrating so badly he had difficulty keeping his grip on it. The copter emitted a great belch of black smoke as it veered severely to the left, nearly hitting the canyon wall before the pilot recovered and steered away from the sheer, rocky face. "What did I tell you! These damn copters are not designed to run in this kind of cold!" The dwarf's copilot and companion in the right-hand seat peered worriedly at the looming canyon walls on either side of them. He glanced back down at the map again and tried to gain his bearings as to their location. Snow and wind relentlessly blew in their faces as he attempted to locate on the parchment the canyon they were navigating. It was bitter cold up here. Even with thick fur flight suits and hats as well as double-thickness woolen gloves they could barely stand the frigid air. "Cripes Gallin, that was close...watch it or we'll end up permanent residents of this place. Frozen and quite dead residents I might add!" Gallin turned to his copilot. "Dari - I just saved our lives I'll have you know! I can barely keep control of this thing, and the cold is wreaking havoc with this damn steam engine. We might have to go to a lower altitude to keep it running." Just as he finished the word "running" the copter shuddered violently again and a strong cross wind nearly blew it up against the other wall of the canyon. "WATCH OUT!!!" Dari screamed as the copter's spinning blades nearly struck the side of the rocky crevice. The dwarf messenger stumbled as he trudged through the drifting snow. He drew his cloak tighter about his upper body and shoulders and pulled his hat further down over his ears. "By my grandfather's beard, this is no place for an army!" he thought to himself. After turning round a sharp bend that wound its way through a belt of tall pine trees, he finally spied the Empire sentries. They looked even colder than he was. The halberdiers would usually have been brightly attired in their regimental clothing, with a rakish round hat and great feather affixed to its top. But now their red pantaloons had been replaced with brown woolen trousers. Their puffy-sleeved shirts and padded gambesons were now completely covered in thick, brown woolen greatcoats with skirts that reached below the knee. The hats were present but the feather had been removed and the entire cap was covered in a woolen hood that covered the sentries' ears and necks. Even their stockings had been pulled up around the outside of their trouser bottoms and tied with cord to keep out the relentless cold. The dwarf stopped and signaled with a wave. The sentries suddenly stiffened. One of them called out to the stooping figure among the trees. The dwarf stood up and shouted, "I have been sent by the great General Gundin of the Dwarven Holds. I bear a message for your commanding general!" One sentry nodded to the other and both strode out to meet the dwarf messenger. They halted a few feet away from the dwarf. Both of the halberdiers eyed him warily. The dwarf eyed them in return. After several awkward moments had passed the first sentry spoke up. "Your message?" asked the sentry. The dwarf reached into a deep breast pocket of his coat. He produced a small, leather cylindrical case. It was bound by a small buckle and strap as well as being bound by several additional leather cords tied around it. He reached across the space between them and offered it the sentries. The first sentry took the case from the dwarf's grasp and tucked it somewhere deep inside his woolen coat. The dwarf paused and then straightened. He produced a pipe and a small leather pouch from a different pocket, then from the same pocket drew out a small flint and tinder. He carefully and deliberately opened the small pouch, pinching out a quantity of tobacco and pressing it into the bowl of the pipe. He then moved close to a pine tree and used it to shield his pipe and face from the unceasing wind. After a few sharp clacks of his flint a spark caught up in the tobacco, then another. He puffed deeply as the sparks began to catch until he had a glowing crown at the top of the bowl. The dwarf let out a heavy breath as he put away his other smoking implements. Leaning on his axe he took a few, deep satisfying draws on his pipe. The smoke drifted upwards as it curled about the dwarf's head before being carried away on the wind. All the while the pair of Empire soldiers eyed him curiously. The dwarf clasped the pipe between his teeth. "Damn cold out here, isn't it fellows?" The sentries seemed taken aback. Finally the second sentry replied, "Yes. Indeed it is cold. Frightfully so." Suddenly a strange chopping sound overhead cut through the thick atmosphere. It grew louder until it seemed to be almost directly over them. After a few moments the chopping sounds began to subside until they faded into the distance. The dwarf grinned and said softly to himself, "Those crazy bas***ds. We're actually trying to fly our steam copters in this frozen wasteland. If their engines don't give out in the cold they'll be lucky not to fly straight into the side of a hill or a tree hidden by the fog." The second sentry could hear the dwarf musing to himself but couldn't make out the words. "Excuse me? Was there something else you wished to convey to us?" The dwarf returned his gaze to the two Empire soldiers. "What? Ohhh, no nothing, just planning my route back to camp is all." The second sentry's eyes narrowed. He looked out past the dwarf at the rough path formed through the trees before it faded out completely into the distance. "Well, you've left your message. Please bear in mind that you are here momentarily in truce but now that your message has reached its destination the truce has very limited parameters. You are permitted to return to the confines of your own camp and nothing else. If you attempt to scout the limits of our encampment or make any such movement that suggests such an intent, you will be taken as a prisoner." The dwarf straightened and puffed his pipe again. "Not to worry fellows. I'll be on my way. You had best return to your camp fires, you look about as cold as I feel. I couldn't do any scouting or spying even if I wanted to. My feet are about half frozen and I need to get them thawed out by some nicely glowing coals." The sentries both nodded as they turned away and began to trudge back towards their encampment. The dwarf hefted his axe and turned back towards the belt of huge pine trees and began to weave his way between them. Just before he got out of earshot of the sentries, he paused and turned for a moment and shouted back through the falling snow. "OH - and tell your general, it's too damn cold up here to fight a battle. But you fellows look even colder than we do...bundle up!" The sentries momentarily turned, then resumed their march. The dwarf chuckled as he puffed his pipe. But his chuckle suddenly sputtered out and turned into a shiver that ran down his entire body. He and his lads were keeping their humor about the situation. But this cold was no joke, it was deadly serious. He clenched his pipe tighter between his teeth as he looked worriedly around him at the failing light. It would be dark soon and the already brutally frigid air would become even colder. General Vidskern untied the leather cords wound around the cylindrical case and let them fall away. Unclasping the single buckle the case rolled open revealing the rolled parchment message. Slowly and deliberately he opened the scroll of paper and his eyes scanned towards the top. "To my esteemed General Vidskern greetings! It is regrettable that we could not communicate more directly and in a more hospitable climate. Not wishing to unduly extend your stay here in these difficult conditions, I call to attention the matter that has compelled us to bring our respective armies this far north and so far from our homelands. Regarding the mine and its associated mineral deposits currently located between our camps, it is necessary to inform you of our legal standing and rightful ownership of said site and its deposits. Among my personal baggage is a set of documents that clearly and unequivocally specify that the mine has been and remains under the legal ownership of the Clan Grinsforn of the Dwarven Holds. This documentation of ownership originated with my grandfather, Olin Gundin, and passed on to my father, Orthan Gundin, and finally to me, Futhan Gundin. These documents clearly specify no expiration of time with regards to said ownership of the site and its deposits. I am aware that your most excellent cartographers and historians learned of the location of the site from your surveying map archives and informed you of its age and the length of time it has remained "abandoned" and seemingly unclaimed. Therefore it is understandable your assumption of abandonment and subsequent campaign to bring Empire troops north to claim and secure it. If I may be very direct and to the point. My family came north into this region over 150 years ago, surveyed, discovered, dug, prepared and then sealed the site. Due to resource and other logistical considerations, they have not returned since that time. A substantial quantity of Sulphite deposits, a key gunpowder ingredient needed by both ourselves and your people are contained within these mines. We regret that you have spent so much time and effort to organize a military campaign in an attempt to claim and exploit these deposits, but given the legal ownership that you have now been made aware of we regrettably must direct you to abandon your campaign and remove your army from the immediate area so that we, the legal and rightful owners of the site may begin a peaceful and productive extraction of the deposits. We have no desire to enter into hostilities over this matter, however we are well prepared to defend the site if our request is not honorably complied with promptly. Not wishing to have you and your troops spend a moment more than they need to in such difficult conditions, we anticipate you will begin making immediate preparations to vacate the area." A grin slowly formed over the general's face as he read the letter. By the time he reached "peaceful and productive extraction" he began to audibly scoff and when he reached "Yours Very Truly" he let out what seemed to be a forced exhale of breath combined with a hoot contained within a single blurt of a laugh. Vidskern rolled up the scroll and tossed it end over end onto the table before him. He turned to Captain Gilsa. "OH I'll tell you what it is. It's dwarf legal loops. It's dwarf 'diplomacy'. It's another set of secret papers that conveniently 'prove' that the dwarves own everything this side of the god forsaken mountains. It's another dwarf family politely explaining to me that some long-bearded signatures on some tobacco-stained documents signed a HUNDRED YEARS AGO prevent me from extracting minerals from a mine that hasn't been touched in over a century. That's what it is!!" The general couldn't contain himself. "Personal baggage. Personal baggage. They ALWAYS have something 'in their personal baggage' that explains why the sun revolves around their glorious mountains! Of course, nobody can actually SEE what's in the personal baggage. But OH they assure me it explains everything!" General Gundin's dwarf column makes camp while still below the snow line during their march up the mountains to Frosthollow Pass. "Cripes alive! Does that man want both of our armies to freeze to death up here? We've given him a polite warning and explained our rightful ownership of those damn mineral deposits. And all I get from him is insolence? If the East Road is still cut by his forces as late as this morning then that can ONLY mean he intends to fight." Captain Thorne shuffled several papers on the general's table and placed another directly between his hands. Gundin angrily snapped up the quill from the inkwell, spattering ink across the papers arrayed before him. He hastily scrawled his signature across the bottom of the supply requisition. Returning the quill to the inkwell he suddenly swept aside the remaining papers before him, scattering several to the floor. An aide hurried up to the table and gathered the spilt papers and returned them to the table. "Enough of this!" Gundin exclaimed. He slammed his fists on the table so hard the inkwell bounced and ink flew in a great arc across the table, spattering the aide and the general's own tunic sleeve. "We've been up in these mountains for over a week. I'm done playing politics with Vidskern. DONE." He swept the papers aside yet again and angrily jammed his finger into the map directly on the spot the mine was located. "You see that little dot there Thorne? You see it? That little dot is my family's mine. That sulphite belongs to ME. To ME..."
A thick, silent tension filled the large tent. The aide nervously wiped his sleeve and stooped to gather the general's papers once more. Tucking them under one arm he gestured to the Captain, indicating there were more forms that needed signing. Thorne glanced sideways and waved off the aide. He silently mouthed, "later" and the aide straightened and exited the tent. General Gundin composed himself and took several deep breaths. "Captain. Summon Commander Brithin, Captain Moorestone, and Captain Darmond. We're breaking camp. We will attack along a general front and break through the East Road blockade." For a moment Captain Thorne doubted that he had heard the general's words correctly. "Sir? We're...we're assaulting the Empire battlelines in the midst of a blizzard? We're going to commit to battle...here?" The general slowly turned to the captain. He met the captain's gaze with an icy cold, seething glare. Gundin held his breath for a moment. For a half-second Thorne almost expected the general to strike him. The general remained frozen, his glare unwavering. "Summon my officers - captain. We will attack." Captain Thorne shrank back. "Right away sir." There are many magic rings in the world Bilbo Baggins, and none of them should be used lightly! The post was edited 42 times, last by Baranovich ( Apr 14th 2019, 1:56am ). Love it! Last bat rep was really great! Have no fear, will be back to work on it this week! Part 1 is posted! An encounter between a dwarf messenger and two Empire sentries sets the stage for the legal dispute over the old mineral mine. Part 2 is posted! The Empire general receives the dwarves' message, much to his delight, lol! Thay top pic has strengthened my resolve to build a snowy table as one of my table options when I move into my bigger place in January. So, how did this battle end up? Yes, when’s the next installment due out? LOL, if I remember how it went, it was a slaughter on both sides.